A gourmet backsplash via marble cheeseboards! Love my new back-splash/cook-top area! Having spices, olive oils, etc. accessible while cooking is so handy! My new Bosch Dishwasher! Why did I wait so long? Though my other appliances are white, it still fits in nicely! I'm sharing pictures of my new H&M zip-up cable-knit sweater. I love that it can keep zipping up and can give full coverage of your neck when its really cold outside too. I think it's going to be one of my favorite GO-TO pieces! I love my new plaid button up shirt! Even in retail stores (which I admittedly don't frequent often anymore) I've always had trouble finding a plaid shirt that I actually like. I usually I don't care for the colors, or otherwise I don't like the pattern of the plaid. Finally, a thrift store has revealed to me a cute plaid shirt! Another reason why I say..... you can find anything at the thrift store with a little patience! Just have fun and embrace the hunt! And please don't mind my wet hair in these pictures! Ufda! How do you spell R-E-L-A-X? Large Fluffy Pillows! I absolutely love large fluffy pillows piled everywhere. To me they invite relaxation. Here are a few pics. While almost everything I purchase for our home is found via thrifting, these Shabby Chic pink euro's and the rose-blossom euro-shams (2nd pic) are an exception. These Rose-blossom shams were a birthday gift from my husband. He purchased these for me at the SF Shabby Chic store several years ago. Love them! Look at this beautiful vintage beaded purse...What a find!! I've decided that although it would be great for a fancy evening or event, I'm still going to wear it casually...that way I can show it off! Love the look of pretty perfume/fragrance decanters sitting out on a silver tray! Adds a bit of sparkle to the room! Decanter/fragrance bottles come in a variety of sizes and shapes. Often easy to find at thrift-stores. "Romance" by Ralph Lauren. My all time favorite fragrance. Can't get enough of it. And for some reason, can't throw out the empties. Love this scent by Pamela Anderson. Perfume bottles just look so lovely sitting out.....ready to use. Here, an array of decanters sit atop a pretty mirrored round tray. (Also found at thrift-store). Love romantic lighting! Have found some beautiful lamps, globes, shades, etc at thrift stores and flea-markets. Here is a sampling. These little lamps cast a soft romantic glow! Love this pink globe found at a thrift-store in Brookings, Oregon for $1.00. Found this pretty little lamp with the hanging crystals at the Paris Flea Market! Love grouping many pretty lamps together. It imbues romance! View from the hallway. Lamps, mirrors and book-cases........all from thrift-stores! Whenever I go thrifting, I keep an eye out for pretty magnets. 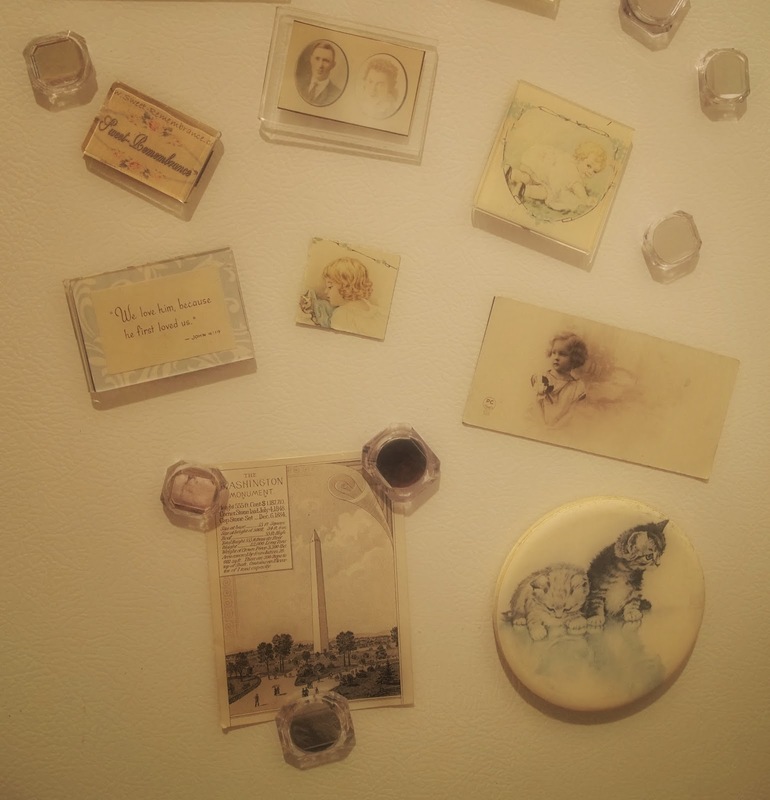 Here are a few pretty ones (picked up at thrift-stores) that I have placed on the side of the refrigerator in our vacation cottage. 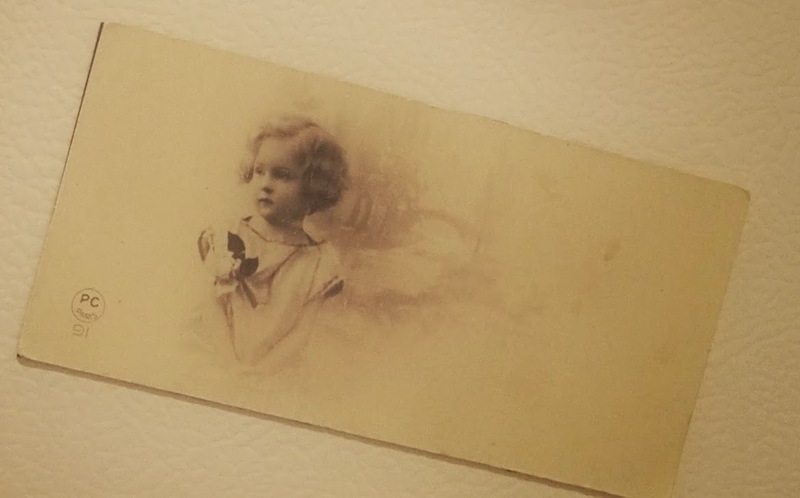 This little french photo card has a magnet backing. Love this! Love the beautiful faded colors in this kitty magnet! An array of pretty magnets! 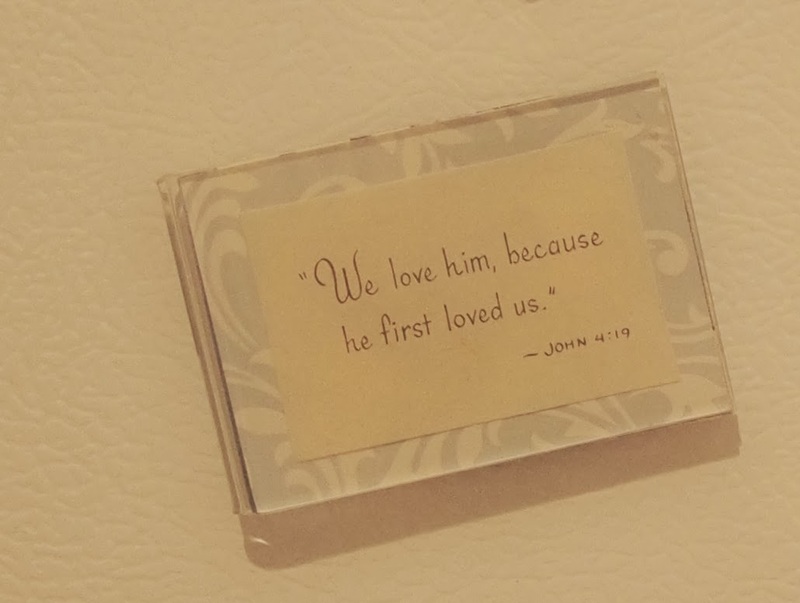 A favorite Bible verse magnet! 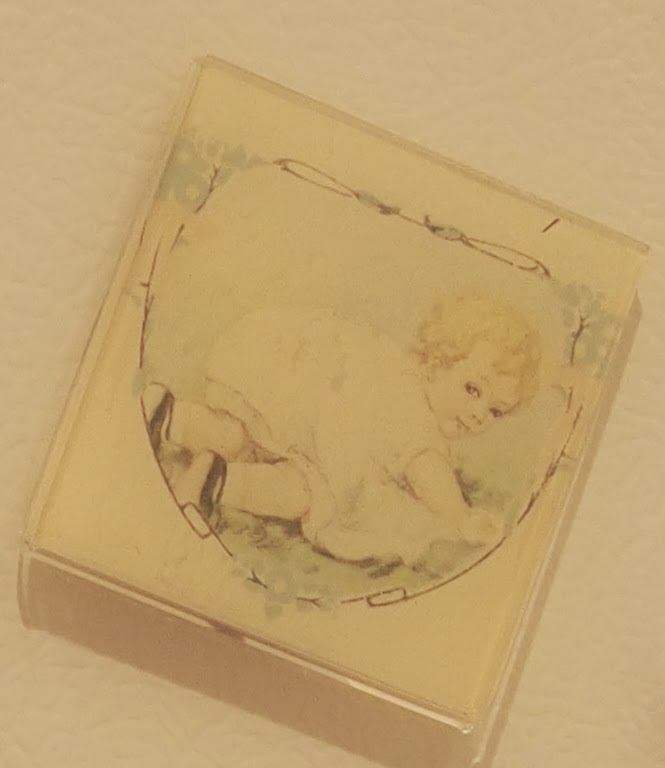 Baby pic in clear acrylic frame magnet. 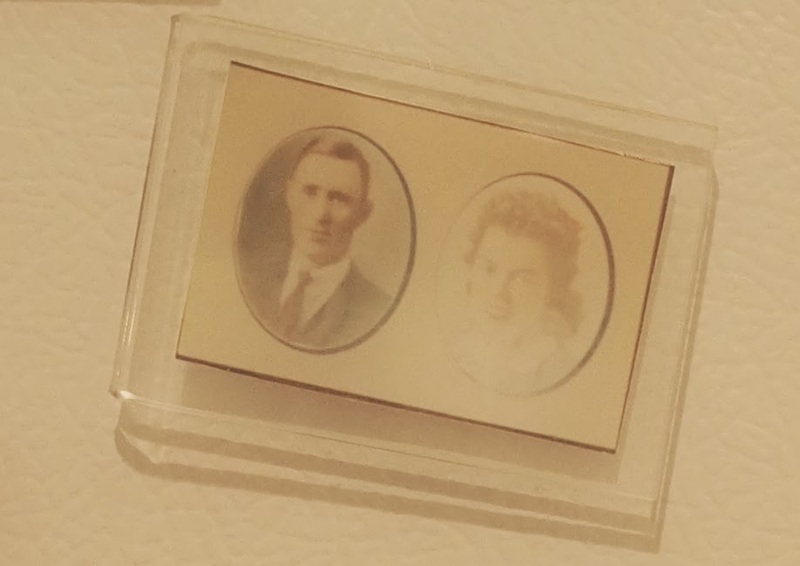 This little acrylic photo frame magnet has a mini pic of my parents in it. Love! 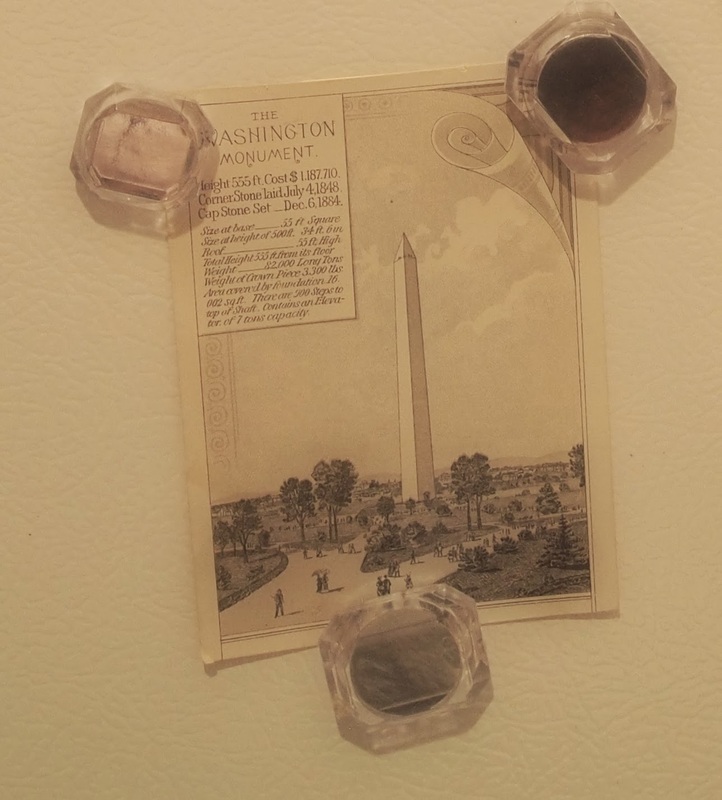 Used little clear magnets to hold up this pretty Washington Monument photo card! Love, Love, Love Valentine's Day! In light of this romantic day,.......enjoy these pics of my favorite hearts....found at either thrift stores or flea-markets. Purchased this little empty pink box for .25 cents and absolutely love the sentiment! It looks so pretty on my vanity holding a bit of jewelry! My sweetheart chair. An all time favorite piece of furniture! Bought this little heart necklace at a thrift store in Eureka for .75 cents. Love it! A heart shaped crocheted pillow found at the bi-annual street fair in my area. These are my favorite heart earrings. I have had them for years and years! Love these little pink heart earrings too! I made this little heart pillow for my new grand-niece. The lace heart was a piece I cut out from a nightgown that I bought at thrift store for $1.00. Didn't like the nightgown but knew that the lace heart in the back would make a pretty pillow. The embroidery thread I purchased at thrift store for .25cents to make the pillow above. What is Valentine's Day without a little romance! Bought this print at a thrift store a few years ago. Love it! And of course Valentine's day just wouldn't be quite right without a lot of pink flowers! Finally, my favorite heart is not from a thrift store or a flea-market but from the HEART! My mama made this heart for me years ago using a scratch-art technique on printed tin. My mom is in a nursing home now, and I miss her so, but this heart makes me think of her! Vintage clothing racks to inspire!